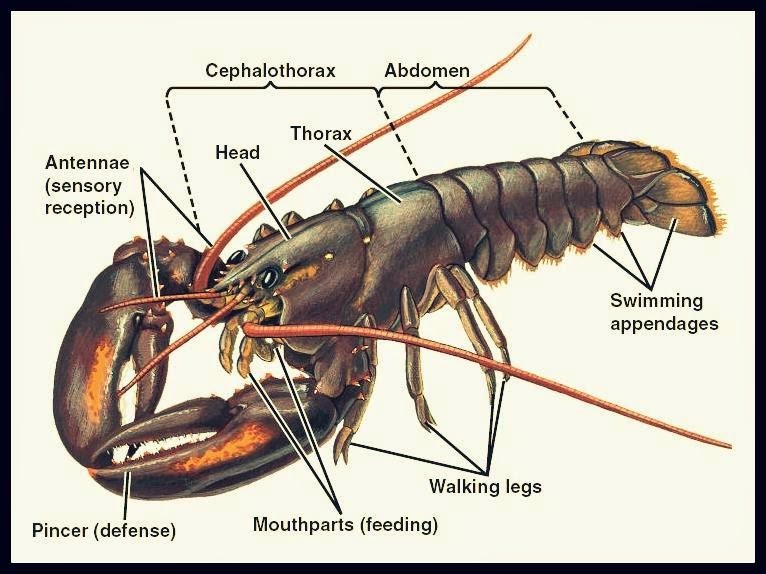 Another interesting fact about these heaviest existing arthropods is that before the mid-19th century, lobsters weren't as popular a cuisine and were considered rather a poor man's food, often fed to the servants and prisons (much to their displeasure of course). They were also used as mere fish baits and fertilisers! Good lord, the waste!!! 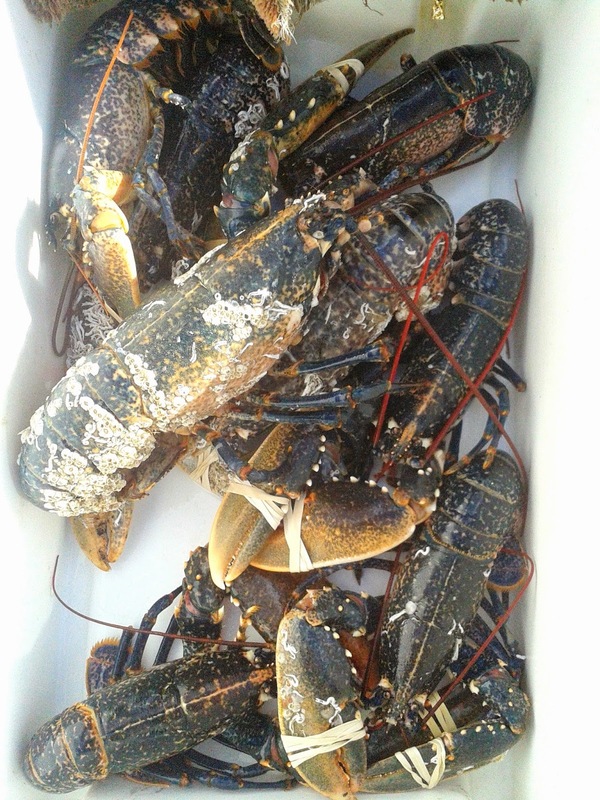 So, coming to cooking one of them, today I went to my local fish mongrel van that comes every wednesday at 6PM just by my university bringing a small but fine selection of fresh sea creatures such as scallops, salmon steaks, pomfrets, lobsters, crabs, snails, razor clams, and other sea fishes. 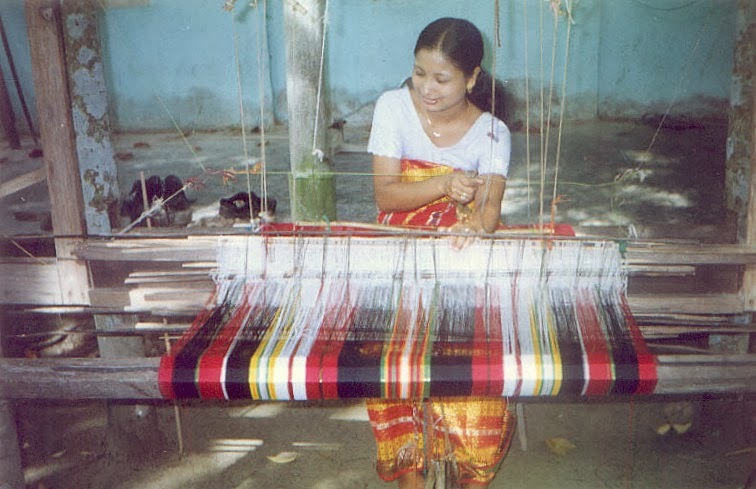 They are indeed pretty fresh, and most are alive during the time of trade. The procedure is quite straight forward and simple (if you can overcome the fishy smell that I somewhat cannot stand). I also prepared a sauce just to go with it although you do not actually require one since the lobster alone is quite appetising in itself. So, to start with the cooking, I first boiled about 1.5-2 litres of water along with 1 tablespoon of salt. 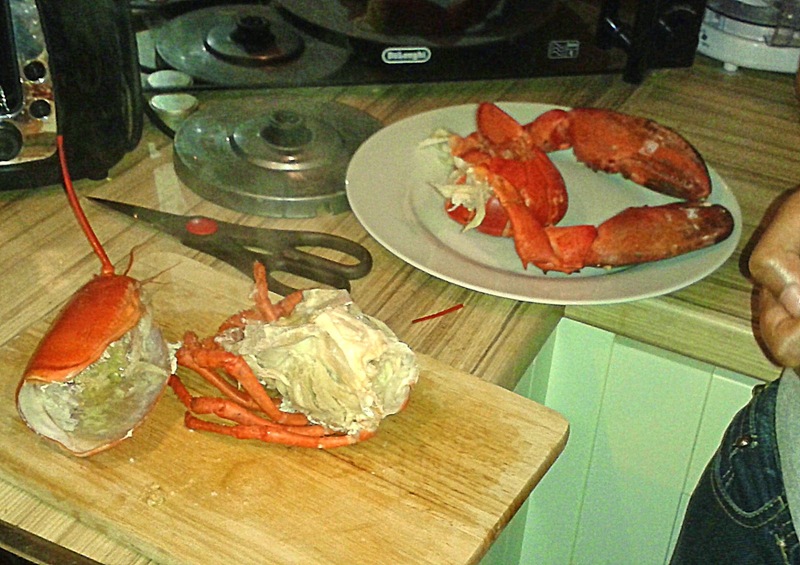 Once bubbling, I lowered the lobster, head first in to the pot and then covered it with lid. 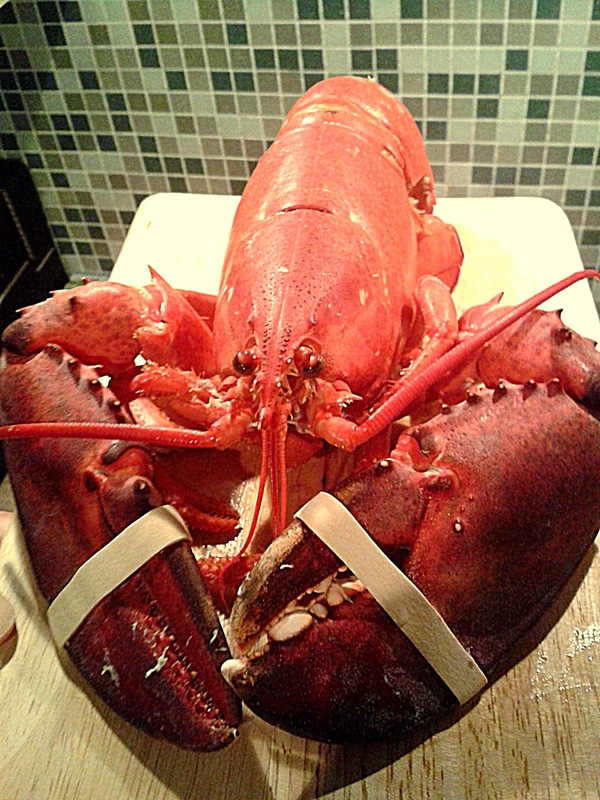 Now, if your pot isn't large enough that's not a problem at all, you can take turns in cooking the two halves of the lobster, either head and the tail, or dorsal and ventral sides (back and stomach sides). I had to turn my lobster around once too since the claws had rendered it rather difficult in my pot to submerge the whole lobster in the water (as you can see in the picture above). It takes about 15-20 minutes for an average 1.5 lb. lobster to cook, including turning. 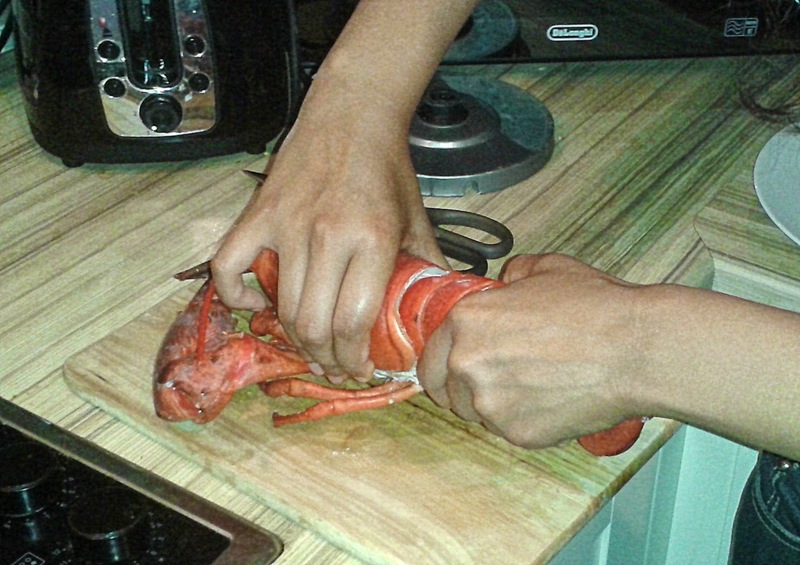 Best way to know if the lobster is done is when the shell turns bright orange-red. 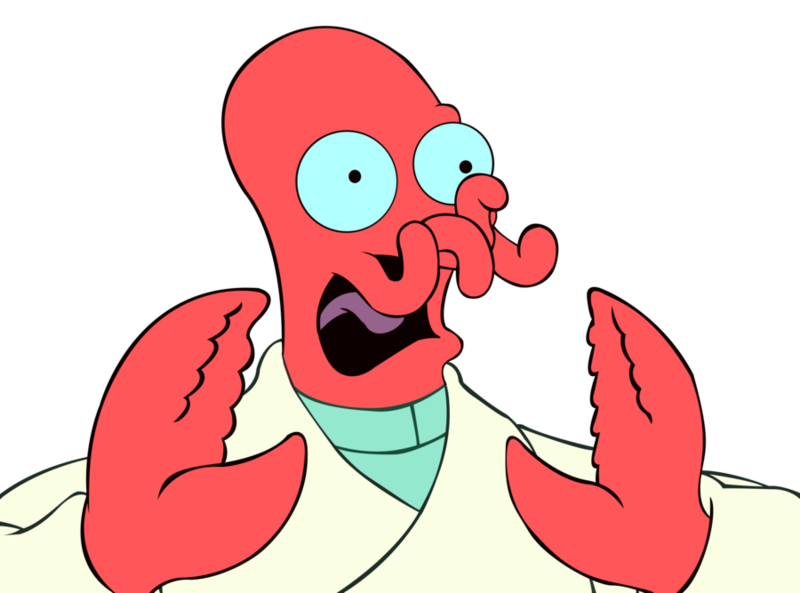 However, bear in mind that big lobsters turn red quicker than they are actually cooked (as I learnt here). 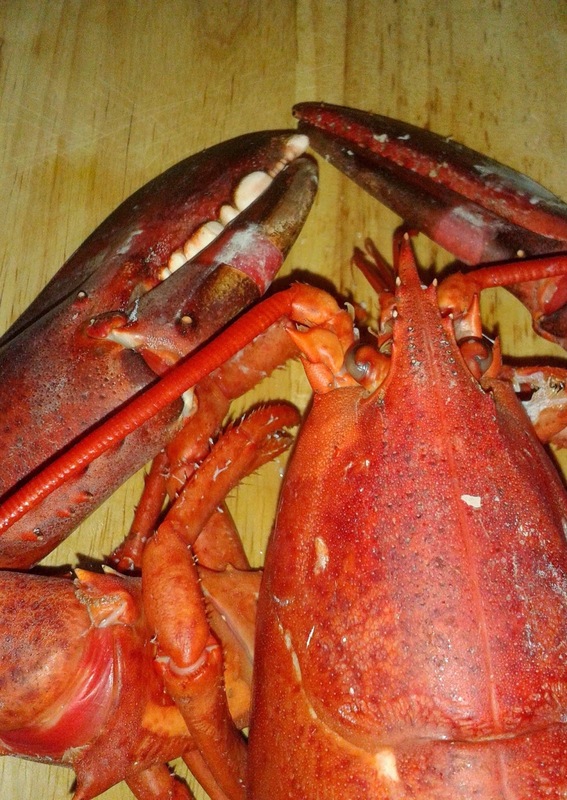 Do not under or overcook the lobsters, when undercooked it would look translucent like them shrimps and the somewhat crunchy taste may not be that great, whereas if overcooked, it will be rubbery (same as the shrimps) and chewy, and again not too great. 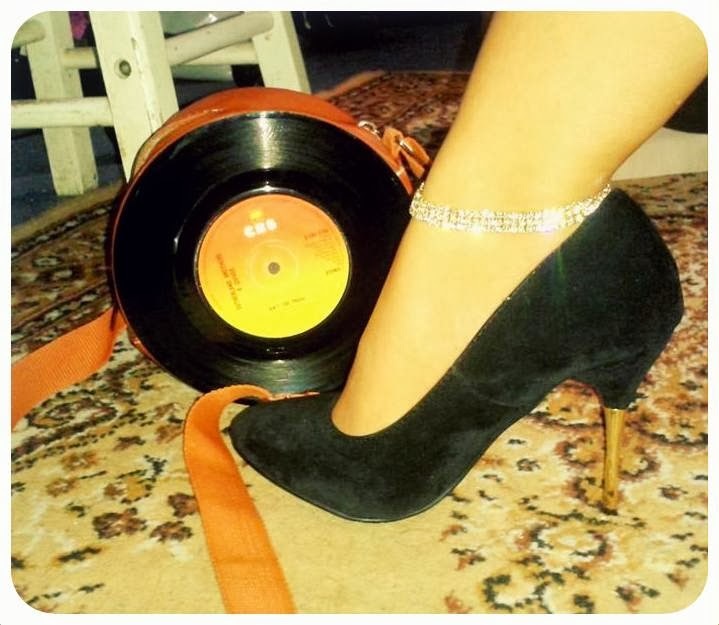 Make sure you get it right by timing it well. Alluring fiery red colour just adds to the appeal of this delicious (but somewhat smelly :p) wholesome meal packed in Vita B12, phosphorus, copper, zinc, selenium and protein. Yum yum!!! So, this is something I learnt from my expert lobster fiend friend and it turned out to be pretty easy process too. First of all I separated the head from the tail. Hold the head with one hand and the tail with the other and gently twist the two in opposite directions for a torque. Keep going till the two twist off of each other and separate easily, it shouldn't require a lot of strength. Next is removing the yummy flesh from the head. I just used my thumb to push the shell open like a box lid attached to the box with a hinge. There isn't a lot of flesh in the top bit but a lot of gooey greenish liver that can be added to the sauces, dips, soups or spread on toast as some people like it. It indeed is quite nice to taste. Now comes the most meaty bit, the abdomen and swimming appendages a.k.a tail. You could either remove the exoskeletal sections one by one or simply (as my friend instructed) use a pair of scissors and snip through the centre of the tail as shown. 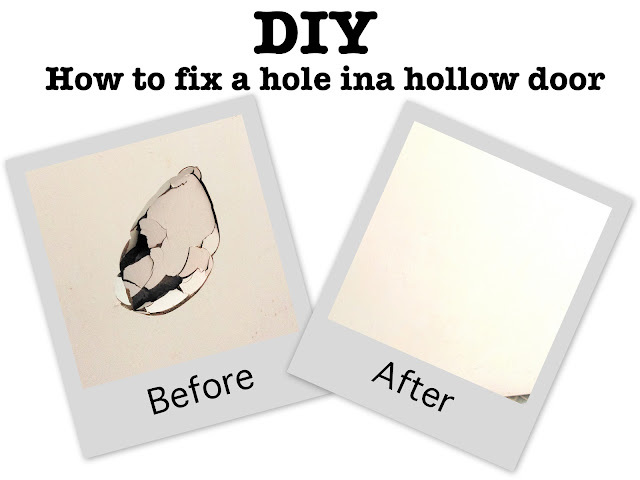 Once the shell has been cut into two it should be fairly easy to remove the flesh from the shell at one go. I just divided them into two sides and peeled it off. Finally, to get to the meat in the cheliped, the first legs that are modified into claws as the lobsters grow up. Ideally it is best if you have a nut cracker handy, but if not just use a hammer and crack the claw open, then remove the meat from inside the claw. 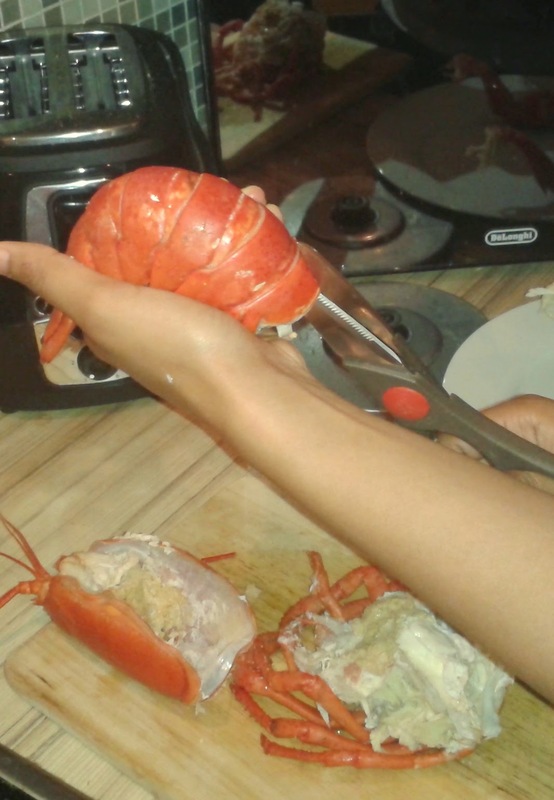 Mind you the broken claw shell edges can be very jagged and sharp, and quite hard depending on the size of the lobster. Also, while cracking the claws be sure not to hammer too hard or else you might crush the meat too. Now, you could either eat it just as it is, or additionally add it in soups, salads, smother it with lemon butter sauce or (as I did) in a zesty tomato garlic butter sauce. Melt a dollop of butter in a sauce pan and fry a teaspoon full of minced garlic and half an onion (chopped). Then add either a bit (1 tablespoon) of pasta sauce or 2 medium chopped tomatoes. Simmer for a bit. Add salt to taste, ginger powder and black pepper. Cook for 3 minutes. You could also add the lobster liver and some chilli to give some zang to the flavour. 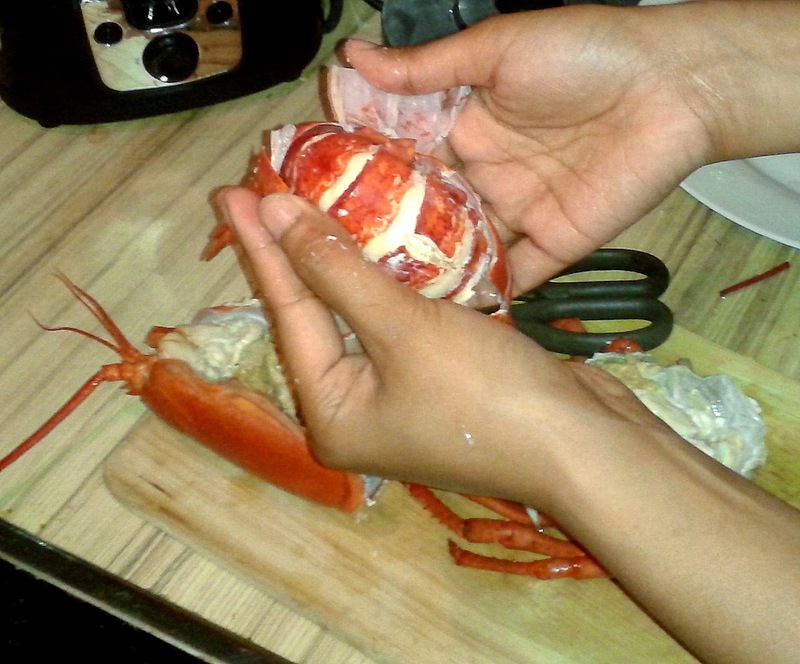 Hope you liked my recipe and a little tutorial on how to clean/de-shell your lobster. Try it and let me know how you find it. P.S: Ssssh! 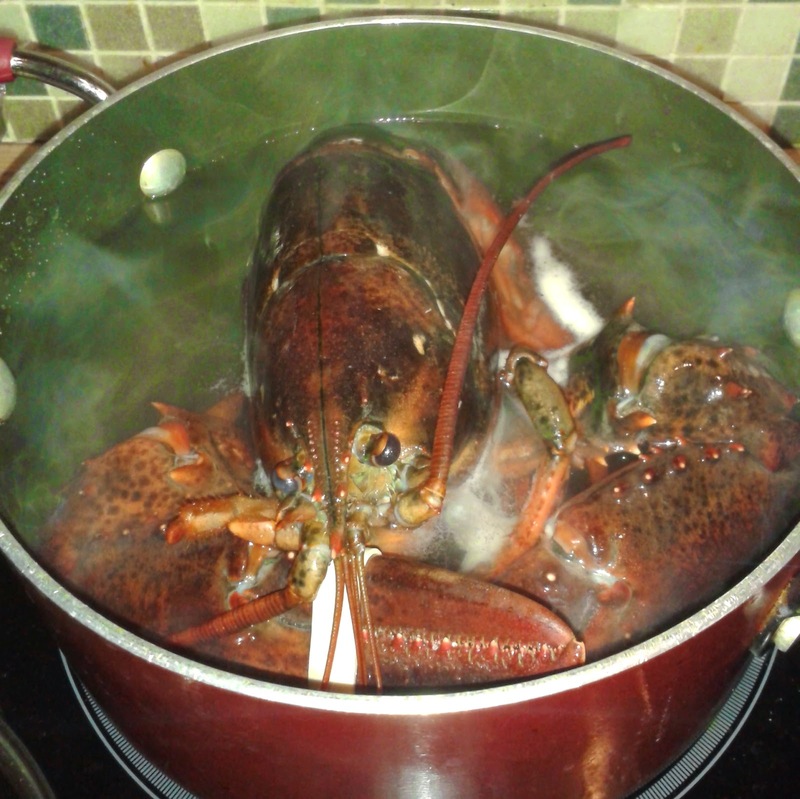 Don't tell Zoidberg I boiled his cousin!